MAP was really the only “whistle blower” back in 1992 that brought mangrove loss / shrimp farm expansion issues to international attention. MAP’s early and ongoing work on this issue, as well as proactive actions bringing attention to other unsustainable shoreline development issues, has inspired a global mangrove conservation movement. 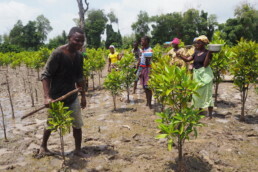 Following the Indian Ocean tsunami of December 2004, MAP was one of the first to substantiate that mangrove loss and degradation were a major factor contributing to extensive loss of human lives and property. MAP’s call to restore the protective greenbelt buffers that healthy mangrove forests provide was heard widely and has been adopted as policy by governments and international institutions alike. Publicize within the developed nations the basic needs and struggles of Southern coastal fishing and farming communities affected by the consumer demands of the wealthy nations. Since 1998, the US office also produces a bi-weekly electronic news bulletin, The MAP NEWS (originally published as The Late Friday News), which contains action alerts and related published articles. MAP also participates in international fora and public presentations, all of which have helped to establish international links, alliances, and action-oriented plans. Following the tsunami of December 2004, MAP was one of the first to point to mangrove loss and degradation as a major factor contributing to extensive loss of human lives and property. Its call to restore the protective greenbelt buffers that healthy mangrove forests provide was heard widely and has been adopted as policy by governments and international institutions alike.